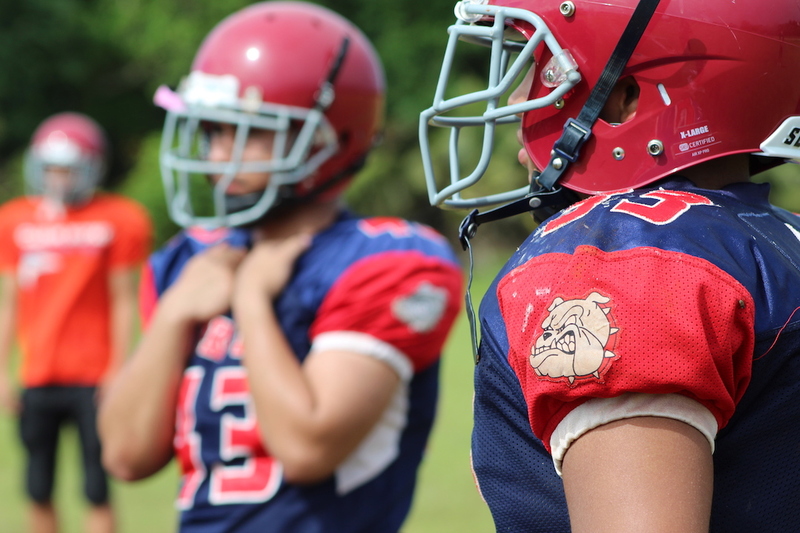 The Okkodo Bulldogs will be one of the last teams to suit up on opening IIAAG Football weekend against the GW Geckos at the Okkodo Field. Under second year head coach Dave Cruz, Okkodo’s football program is planning to build a future with a lot of its young talents. Playing in the afternoon heat on Saturday doesn’t sweat the Bulldogs with the players more excited than anything to just get their season started. UPDATE: The Bulldogs and Geckos will face off at 7 pm at the Okkodo Field. Okkodo Bulldog Quarterback Andrew Perez. One of Okkodo’s newest weapons will be coming under center in junior quarterback Andrew Perez. The current St. Paul student elected to suit up for the Bulldogs after quarterbacking the Island Saints over the course of his GNYFF career, following his Saints coaching staff who make up most of the Bulldog’s current coaches. Now facing his toughest challenge yet, Perez is ready to face a stronger and much faster caliber of football, a moment he’s been looking forward to since outgrowing the GNYFF. “I’m looking forward to passing a lot and, of course our, goal is to win a championship. Some of the big adjustments I would need to make is just being able to trust my line more and stay in the pocket to complete a pass,” said Perez on the outlook of his transition into the league. Big moments are no stranger to Perez after helping guide the Saints to their first ever GNYFF title in his last season. From one group to another, Perez is hoping to lead the Bulldogs towards the same type of success he’s been able to find in the youth league. “I’d like to try and improve Okkodo’s football culture since we haven’t been in contention for finishing as one of the top teams. Hopefully I can help develop the team into a winning culture and just overall help the school and program out,” said Perez. One of the major pieces for the Bulldogs will be in the center of all the action, on both sides of the ball. Rico Nedlic, younger brother of former Bulldog standout Arthur Nedlic, has taken the leadership role on both the offense and defensive line. “It’s my job to make sure everyone else does their job,” said Nedlic on his role. “We have a lot of new players, but we’re working hard on both offense and defense. We’re motivated to keep moving up as a team,” said Rico. The Bulldogs will be one of four teams making their debut in a day game. But as far as Nedlic sees it, playing under the sun won’t be that difficult a transition. “As long as we come to practice every day then we’ll get used to the weather,” said Nedlic. Catch some of the newest weapons on Saturday as the Bulldogs take on the Geckos at 3 pm, the last game of opening weekend!